Recent research suggests that schizophrenia involves problems with brain chemistry and brain structure. Howeve, no single cause has been identified to account for all cases of schizophrenia. Scientists are currently investigating possible factors contributing to the development of schizophrenia. These factors include viral infections occurring early in life, abnormalities in the developing fetus, middle-brain damage due to birth complications, and genetic predisposition. Brain-imaging technology has demonstrated that schizophrenia is as much an organic brain disorder as is Parkinson's disease or multiple sclerosis (Brier, 1999; Kennedy, Pato, Bauer, Carvalho, & Pato, 1999; Sherman, 1999a). Numerous theories about the cause of schizophrenia have been developed. Some of the more common theories are described here. The genetic, or hereditary, predisposition theory suggests that the risk of inheriting schizophrenia is 10% in those who have one immediate family member with the disease, and approximately 40% if the disease affects both parents or an identical twin. About 60% of people with schizophrenia have no close relatives with the illness (Sherman, 1999a). The first true etiologic subtype of schizophrenia, the consequence of a chromosome deletion, deletion syndrome, has been identified. Persons with this syndrome have a distinct facial appearance, abnormalities of the palate, heart defects, and immunologic deficits. The risk of developing schizophrenia in the presence of this syndrome appears to be approximately 25%, according to Dr. A. Bassett of the University of Toronto (Baker, 1999; Kennedy, et al., 1999; Sherman, 1999d). Scientists also may be close to identifying genetic locations of schizophrenia, believed to be on human chromosomes 13 and 8. One study found that mothers of clients with schizophrenia had a high incidence of the gene type H6A-B44 (Kennedy et al., 1999; Sherman, 1999d). Research is now exploring how to proceed with genome scanning and DNA marker technology. The reader is referred to resources in the field of neuropsychiatric medicine for additional information. 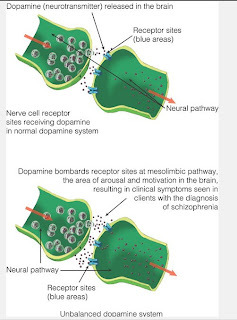 The biochemical and neurostructural theory includes the dopamine hypothesis: that is, that an excessive amount of the neurotramsmitter dopamine allows nerve impulses to bombard the mesolimbic pathway, the part of the brain normally involved in arousal and motivation. Normal cell communication is disrupted, resulting in the development of hallucinations and delusions, symptoms of schizophrenia. The cause of the release of high levels of dopamine has not yet been found, but the administration of neuroleptic medication supposedly blocks the excessive release. Other neurotransmitters or chemicals in the brain, such as the amino acids glycine and glutamate, and proteins called SNAP-25 and a-fodrin, are also being studied (Kennedy et al., 1999). Abnormalities of brain shape and brain circuitry are being researched as well. Supposedly, a circuit filters information entering the brain and sends the relevant information to other parts of the brain for determining action. A defective circuit can result in the bombardment of unfiltered information, possibly causing both negative and positive symptoms. Overwhelmed, the mind makes errors in perception and hallucinates, draws incorrect conclusions, and becomes delusional. To compensate for this barrage, the mind withdraws and negative symptoms develop (Kennedy et al., 1999; Nidus Information Services, 1999a). Those who suggest the organic or psychophysiologic theory offer hope that schizophrenia is a functional deficit occurring in the brain caused by stressors such as viral infection, toxins, trauma, or abnormal substances. They also propose that schizophrenia may be a metabolic disorder. Extensive research needs to be done, because the case for this theory rests mainly on circumstantial evidence (Well-Connected, 1999a). Proponents of the environmental or cultural theory state that the person who develops schizophrenia has a faulty reaction to the environment, being unable to respond selectively to numerous social stimuli. Theorists also believe that persons who come from low socioeconomic areas or single-parent homes in deprived areas are not exposed to situations in which they can achieve or become successful in life. Thus they are at risk for developing schizophrenia. Statistics are likely to reflect the alienating effects of this disease rather than any causal relationship or risk factor associated with poverty or lifestyle (Kolb, 1977). Experts suggest that the risk of schizophrenia exists if the developing fetus or newborn is deprived of oxygen during pregnancy or if the mother suffers from malnutrition or starvation during the first trimester of pregnancy. The development of schizophrenia may occur during fetal life at critical points in brain development, generally the 34th or 35th week of gestation. The incidence of trauma and injury during the second trimester and birth has also been considered in the development of schizophrenia (Well-Connected, 1999a). Although genetic and neurologic factors are believed to play major roles in the development of schizophrenia, researchers also have found that the prefrontal lobes of the brain are extremely responsive to environmental stress. Individuals with schizophrenia experience environmental stress when family members and acquaintances respond negatively to the individual's emotional needs. These negative responses by family members can intensify the already vulnerable neurologic state, possibly triggering and exacerbating existing symptoms. Stressors that have been thought to contribute to the onset of schizophrenia include poor mother child relationships, deeply disturbed family interpersonal relationships, impaired sexual identity and body image, rigid concept of reality, and repeated exposure to double-bind situations (Kolb, 1977). A double-bind situation is a no-win experience, one in which there is no correct choice. For example, a parent tells a child who is wearing new white tennis shoes that he may go out to play in the park when it stops raining but that he is not to get his shoes dirty. At the same time, the parent's body language and facial expression convey the message that the parent prefers that the child stay indoors. The child does not know which message to follow. The vitamin deficiency theory suggests that persons who are deficient in vitamin B, namely B1, B6, and B12, as well as in vitamin C, may become schizophrenic as a result of a severe vitamin deficiency. As stated earlier, extensive research must be done to prove this theory.